Just the concept of a compact crossover SUV is borderline genius. Compact crossovers perfectly epitomize what so many people want in a vehicle. 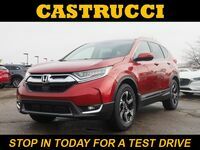 Specifically, the 2019 Honda CR-V comes with nimble handling, interior space, solid performance, and great style. On top of all that, the 2019 CR-V comes packed with modern technology which is vital in today’s world. Standard features include a 5-inch LCD screen, automatic climate control, USB audio, and a multi-angle rearview camera. 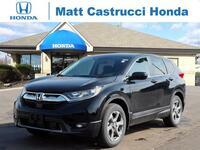 Learn more about this great crossover SUV below. The 2019 model of the Honda CR-V comes in five available trims: the LX, EX, EX-L, and the Touring. The base engine on the LX trim is a 184-horsepower, 2.4-liter DOHC inline four-cylinder motor. All other trims come fitted with a turbocharged DOHC I4 engine powered by 190 horses. Drivers who go up just one trim level to the EX will get SiriusXM Radio, remote engine start, HondaLink®, heated front seats, and a one-touch power moonroof. Features that come standard on the EX-L include a power tailgate, leather-trimmed seats, and leather wrapping on the steering wheel and shift knob. Then we have the top-of-the-line Touring trim. 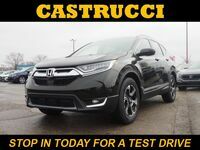 This model comes with hands-free access to the tailgate, LED headlights, Honda Satellite-Linked Navigation, roof rails, and rain-sensing windshield wipers. Well, that sure is a long list of features. Why don’t you come check them out for yourself? 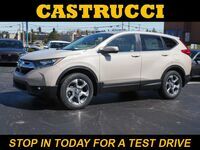 Come down to Matt Castrucci Honda and see our inventory of the 2019 Honda CR-V. We will help you along the way and answer any questions you have. We can go over pricing specifics, finance options, or just let you take a carefree stroll around our showroom. We hope to see you soon!